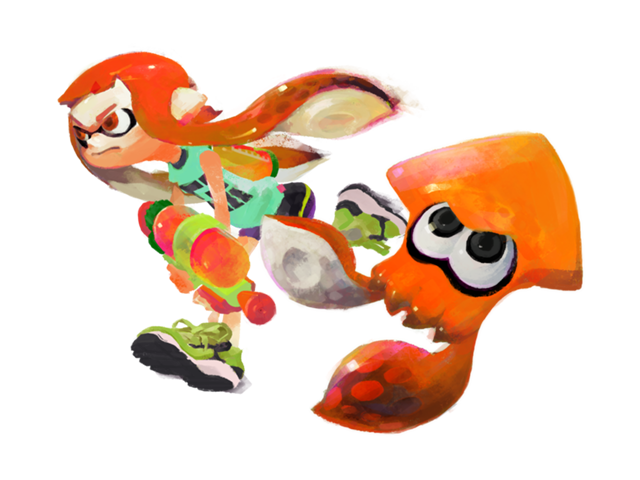 Splatoon is an upcoming third-person arena shooter developed by Nintendo for the Wii U. It's due to release in Spring 2015. 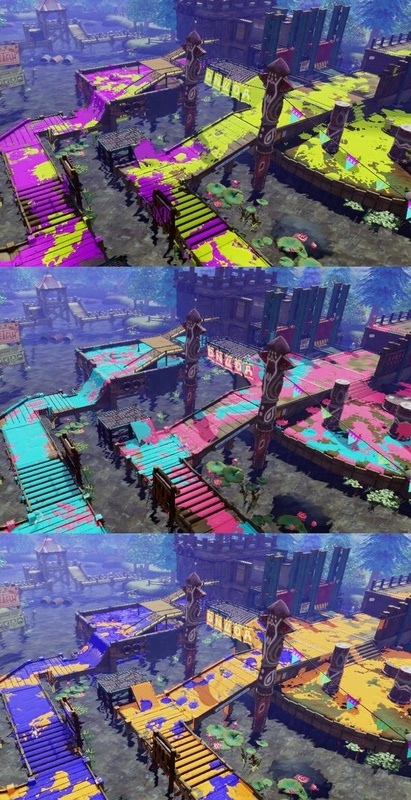 You fight using paint guns on one of two sides, and the goal of the match is to paint the floor of the arena in your team's color. You move at a normal speed when walking over your paint, but you slow to a crawl when walking over the enemy's color. And if you get covered in too much of your enemy's paint, you'll die and respawn back at your base. While on your own color, you can also sink down into the paint to ambush enemies or to swim between pools of paint at high speed to rush around the arena. Oh, and you're playing as some kind of anthropomorphized squid girl. It looks like there's a variety of weapons available, as well as cosmetic customizations for your characters. And while the game is focused on online multiplayer, there's a single player campaign, as well. This isn't quite Nintendo's first foray into online multiplayer shooter games, but it's their first for a home console. It looks like it brings a lot of creativity in both visual presentation and design, and I'm super excited to play it. My biggest concern is that there seem to only be a handful of maps available at launch. However! It looks like they're adding maps as free updates between May and August. If all of the icons they showed represent a new map, it looks like about 9 new maps could get added. They're also adding gear, weapons, and new gameplay modes. Amiibo challenges are basically weapon-specific challenges on old maps. They unlock a couple of costumes. There are 8-bit games you can play while waiting to get paired up into matches. That's kinda cute. Demo up on the eShop. Play online during specific dates and times. Looks like the 8th and 9th. Missed the exact times. Stoked for a demo. That's a surprise. Don't get hung up on map count. TF2 launched with a small map pool (and grew from there over the years) and that didn't hurt it. I think most of the MOBAs operate with a small pool as well. I like having variety (Unreal Tournament was always my favorite on PC partially because of this) but it means that you have less exposure to each map so it makes it harder to learn each map. Also online communities tend to stick with a handful of maps anyways so it's usually better to make a handful of really good maps than to waste resources making a larger quantity. The way they're handling map selection is interesting, if I followed it correctly. Participants are basically given a chance to vote for one of two maps. The maps that are available are the same for everyone across the server and are swapped out every few hours. They're actively trying to prevent the community from settling in to just a few maps they know well. Teams are also re-randomized regularly. I think it's after each match, but it might be every few matches. You can jump into matches with anyone from your friends list, but you're not guaranteed to be on the same side. I think that's pretty normal. Oh yeah? I ... kind of don't like this. I'm sure I'll get over it, but I imagine there's gonna be a lot of ire from certain people. I imagine there's gonna be a lot of ire from certain people. Welcome to Nintendo doing anything at all that involves the internet that isn't in every way identical to how Sony, Microsoft, or Valve does it. Yup. I'm ok with them shuffling teams on a somewhat regular basis. Team balance is probably the biggest pain with online games and while most servers have solutions they're not 100% effective. At least with a regular shuffling it feels like there might be less risk of 1-2 peole just dominating on the same team for a long streak. Also, I think people are starting to come around on some of Nintendo's past decisions regarding things like communication options. Games like Hearthstone have shown you don't need chat features to keep a community. People are still buttheads there but at least they have limited options for doing so. Just finished watching the event, there's definitely a lot of modes in there that will be added on in terms of multiplayer play. I liked the one where you can assemble a team of 4 friends and then go and battle another team of 4 friends. That seems like the one where you'd want to get on Skype and coordinate. And amiibo seems to unlock quite a bit of content as well, so they will do something non-trivial in the game. Although cue the chorus of "amiibo is nothing more than paid DLC" I guess. I'm also pleased that they're envisioning supporting the game with events and additional maps, modes, etc well after the launch. It really feels like an embracing of new models and new ideas by Nintendo for what a game could be. What I like about the way Amiibo functionality is handled here is just owning the Amiibo doesn't unlock content. It unlocks challenges that unlock content, meaning they still have to be earned. I imagine most of those challenges will be rather simple for the most part, but it's still really cool that there's more to it than "Place figure, get candy". Just wish there was something for non-Splatoon based Amiibos. I really appreciate this game as Nintendo allowing some of the younger team members to come in with a fresh idea, because it is so unlike Nintendo in terms of what players expect, and yet it looks to get so much right. To specify, this is for unranked matches. I don't know if ranked battles will work the same, but unranked matches are likely focused on giving everyone a chance to get used to the system and learn new maps rather than getting on Skype with your friends and dominating players that are potentially all unrelated with each other. Especially because ranked battle requires you to be level 10 before you can access it, and it won't even be available until enough players have reached level 10. That they're being so up front about their plans for free DLC is... well, honestly, it's kind of like "Well, sorry Evolve, but this is kind of how you do it". It's almost the same thing, with a multiplayer-centric shooter that is going to offer maps and content to players for free but still cost $60 at launch, but communicated effectively rather than as an apology for a crap ton of superficial skins costing a bunch of money (assuming you'd get it all at once (which no one would)). I wish this would shut people up when it comes to "Nintendo doesn't get online" or whatever, but I guarantee you something (like the lack of voice chat) will insist on saying it still. I'm really surprised at how well they've got the updates scheduled. My only concern is that it partially feels like they're launching early in order to fill a gap in the retail schedule rather than the game actually being ready. Like engineering wanted to ship in August when it'll be done but marketing said to get it out before June. I don't think this is going to be a problem in the long run, but I expect we're going to see a fair bit of griping online from people who mainline the game 24/7 and run out of things to do after a week (aka the high-end MMO players problem). There's still ample time for the other shoe to drop. However, they seem to be taking a TF2* style approach here with the loot chase as well, so aside from the amiibo challenges (and there's absolutely no reason they can't add those as a free update or $5 DLC packs later on) I don't think they're going to be going nearly as nutty as 2K did with Evolve. * More accurate would be late 90's era FPS games like Unreal Tournament which had free map packs available after launch as a "Thank you to the fans" for supporting the game at retail. So, I think I have just about all of you on my Miiverse friend list. If not, my NNID is Zoso1701, as well. Please add so we can SPLAT IT UP (down?) in a few weeks. We are going to try to stay awake for the "Testfire" tonight. Who else is planning to participate? Not sure what features will be active, but it would be cool to join together if we can. If my calculations are correct, 8pm PT is just 11pm ET, so I'll be up for it. It'll kill me the next morning since I gotta be up early, but I'll be up for it tonight. Something that occurred to me, though. My niece is 10 years old (or going to be this summer), and every time I see this game I think about convincing my sister to invest in a WiiU so my niece can enjoy a bunch of these games. But then I wonder about her not-as-good-with-these-controls abilities and wonder... is she really going to be able to enjoy it? Maybe by time she can get into ranked battle, but I'm not sure she'll be having fun if it's her as a kid up against a bunch of teens and adults. I know we joke about foul-mouthed kids all the time when it comes to CoD, but I feel like this is the first AAA shooter that's kid friendly and kid targeted, so... I dunno, I wonder if the only people playing online after a while will be teens and adults because kids got sick of having their asses handed to them. NERF Arena Blast was robbed! If you're color blind or know someone who is, you can apparently put the game in "color lock" mode that keeps the ink to two colors that are easier to distinguish. The alert says 8 PT. So does the website. I know you're just tryin' to troll me again. But I'm wise to your tricks. I like it when you dream. It gives me something to crush. Nah, I was actually serious this time. I swore the alert on the Wii U (which turned on automatically) was saying that it started at 8 ET. Does Nintendo think I'm capable of staying up till 11?!?!? Damn them. I just downloaded the demo but my wife is using the tv. Hope to give it a try tonight or tomorrow. Bill, your wife has 2 hours. Can you access the game without it being an online match? I wanted to see how the local 2 player worked to get my girls over the line with the game (we have the Amiibo's on pre-order, regardless), or is it just a server load test of sorts, and limited to just the online component? I wish ALL my DLC content came with action figures, then I might actually remember that I bought it! Online only at this point. I'll be giving it a whirl tonight. And the servers instantly melt.